Thomas Carter, the director of the new inner-city high-school basketball drama Coach Carter (no relation), was previously the director of Save the Last Dance and Swing Kids. Before that he directed episodes of Miami Vice and Hill Street Blues, and before that he was an actor, most famously playing student-athlete James Hayward on the TV show The White Shadow, a late 70s inner-city high-school basketball drama. So you could say hes come full circle. There are parallels between Thomas Carters first and most recent jobs. Both story lines concern former basketball stars who take high-school coaching jobs and turn a ragtag, insolent team into champions. On his first day on the job, Ken Carter (Samuel L. Jackson) addresses each of his players as sir — giving them the respect he expects in return — and hands out contracts. Among the clauses: They have to maintain a 2.3 GPA, they have to sit in the front row of all their classes, and they have to wear suits and ties on game day. Otherwise: no ball. 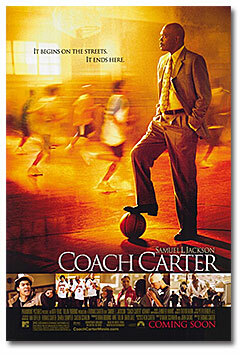 Based on a real story, Coach Carter isnt simply battling the ghosts of White Shadow here but the entire teacher/student subgenre. It often loses this battle. Parents object to Carters tough standards, like the parents in Lean on Me, but hes unapologetic, like that movies Joe Clark. The female principal is at best a silent ally, at worst an obstacle to progress, like the principal in Radio. Players are enticed by gang life, and one players girlfriend gets pregnant, which feels very White Shadow-y — its a subplot that, although it avoids clichéd characters and easy answers, isnt particularly dramatic. Its one of the films weaker aspects. One of its better aspects? The lessons dont stop once the players win; its when the lessons start. Full of themselves now — celebrating easy buckets and trash-talking the vanquished — Carter hilariously does the same during practice to show how foolish they look. Since when is winning not enough? he asks. He counsels against using a racial epithet. He peppers them with life questions. He keeps their eyes on the prize: sports not as an end in itself but as a means to becoming better people. Carters story gained national attention in 1999 when (again, reminiscent of Joe Clark) he chained the gymnasium doors because several players were failing their classes. The team was state-tournament-bound, but Carter refused to allow them to play or practice until they got their grades up. Unlike society as a whole, he puts the student in student-athlete first. This message is certainly welcome, but Coach Carter is overlong and uneven. None of the young actors blows you away, and the final speech is so stuffed with clichés my jaw dropped. Even Jackson is surprisingly one-note in the title role. What is his inner life like? Does he have one? Must decency be dull? This review originally appeared in The Seattle Times on January 14, 2005.